Paul Henry discovered asteroid #164 Eva. J. Helffrich discovered asteroid #701 Oriola. K. Reinmuth discovered asteroids #997 Priska and #3682. Robert Goddard launched one of his A series rockets, which had strainers and thicker air vanes. The flight had 14 seconds of propulsion, and reached an altitude 6600 ft with excellent correction up to 3000 ft. During recovery, the parachute tore off. NASA's Jet Propulsion Laboratory announced construction was under way on the first large space simulator in the US capable of testing full scale Ranger and Mariner class spacecraft, simulating solar radiation, cold space heat sink, and a high vacuum. NASA launched the Tiros 3 weather satellite from Cape Canaveral, Florida. TIROS 3 (Television and InfraRed Observation Satellite), launched 12 July 1961, was a spin stabilized meteorological spacecraft designed to test experimental television techniques and infrared equipment. The satellite was in the form of an 18 sided right prism, 107 cm in diameter and 56 cm high. The top and sides of the spacecraft were covered with approximately 9000 1x2 cm silicon solar cells. TIROS 3 was equipped with two independent television camera subsystems for taking cloud cover pictures, plus a two-channel low-resolution radiometer, an omnidirectional radiometer, and a five-channel infrared scanning radiometer. All three radiometers were used for measuring radiation from the Earth and its atmosphere. The satellite spin rate was maintained between 8 and 12 rpm by use of five diametrically opposed pairs of small solid fuel thrusters. The satellite spin axis could be oriented to within 1- to 2-deg accuracy by use of a magnetic control device consisting of 250 cores of wire wound around the outer surface of the spacecraft. The interaction between the induced magnetic field in the spacecraft and the Earth's magnetic field provided the necessary torque for attitude control. The flight control system also optimized the performance of the solar cells and TV cameras and protected the five-channel infrared radiaometer from prolonged exposure to direct sunlight. The spacecraft performed normally until August 1961, when the scanning radiometer began to fail. Performance was sporadic until 23 January 1962. It was deactivated on 28 February 1962. NASA and the USAF launched X-15A Checkout, Systems Test mission # 160 in which Pete Knight achieved a maximum speed of 5892 kph (Mach 5.34), and reached a maximum altitude of 39.624 km. USSR launched Phobos 2 for Martian orbit. Phobos 2, launched 12 July 1988, operated nominally throughout its cruise and Mars orbital insertion phases, gathering data on the Sun, interplanetary medium, Mars, and Phobos. Phobos 2 entered Mars orbit 29 January 1989. Shortly before the final phase of the mission, during which the spacecraft was to approach within 50 meters of the surface of Phobos and release two landers, one a mobile `hopper', the other a stationary platform, contact with Phobos 2 was lost. The mission ended when the spacecraft signal failed to be successfully reacquired on 27 March 1989. The cause of the failure was determined to be a malfunction of the onboard computer. Phobos 2, and its companion spacecraft Phobos 1, were next generation Venera type planetary missions, succeeding those last used during the Vega 1 and 2 missions to comet P/Halley. The Phobos mission objectives were to: (1) conduct studies of the interplanetary environment; (2) perform observations of the Sun; (3) characterize the plasma environment in the Martian vicinity; (4) conduct surface and atmospheric studies of Mars; and, (5) study the surface composition of the Martian satellite Phobos. The main section of the spacecraft consisted of a pressurized toroidal electronics section surrounding a modular cylindrical experiment section. Below these were mounted four spherical tanks containing hydrazine for attitude control and, once the main propulsion module had been jettisoned, orbit adjustment. A total of 28 thrusters (twenty-four 50 N thrusters and four 10 N thrusters) were mounted on the spherical tanks with additional thrusters mounted on the spacecraft body and solar panels. Attitude was maintained through the use of a three-axis control system with pointing maintained with sun and star sensors. An Ariane 3 launched from Kourou carried Europe's Olympus 1 communications satellite to orbit. Olympus 1, launched 12 July 1989, was a commsat technology demonstration. It was a multi-payload communications satellite for direct TV broadcast in the bands of the 1977 Geneva Plan of the International Telecommunications Union (ITU), including a national beam to Italy, plus communication transponders in the 14/12 GHz and 30/20 GHz bands. The latter were also used for a data relay experiment with ESA's EURECA satellite. 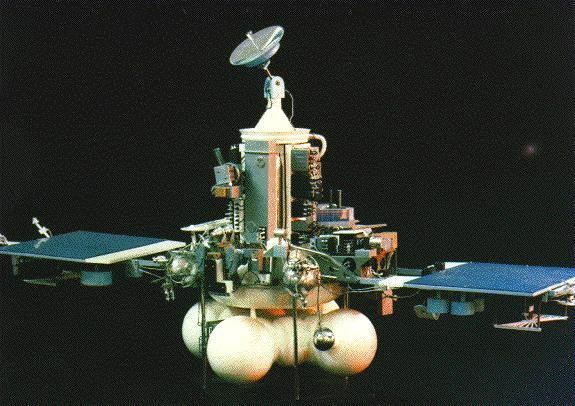 Olympus-1 was positioned in geosynchronous orbit at 19 deg W in 1989-1993. As of 4 September 2001, it was at 82.22 deg E drifting at 3.961 deg E per day. NASA's Galileo probe was released from the orbiter, 147 days before it entered the Jovian atmosphere on 7 December 1995. Russia launched the Zvezda living module of the International Space Station from Baikonur. Years behind schedule, the Russian financed and built Zvezda living module of the International Space Station finally reached orbit when it was launched 12 July 2000. Zvezda's initial orbit was 179 x 332 km x 51.6 deg. On 14 July, the orbit was raised to 288 x 357 km, the ISS was then in a 365 x 372 km orbit. After matching orbits with the ISS, Zvezda became the passive docking target for the Russian built, US financed Zarya module already attached to the station. The Zarya/Unity stack docked with the Zvezda module at 00:45 GMT on July 26, forming the basic core of the International Space Station. NASA launched STS 104 (Atlantis 24) to the ISS on International Space Station Flight 7A. Europe's Artemis communications satellite was left in a low orbit by its Ariane 510 launcher, but was able to achieve its intended geostationary orbit using its own engines. Artemis, launched 12 July 2001, was a European Space Agency satellite designed to test new communications technologies. The Ariane 510 vehicle carrying it to space failed to reach its correct orbit. The solid boosters and main stage worked as planned, and put the EPS upper stage in the planned near-suborbital trajectory. The EPS stage then fired, but the Aestus engine failed to reach full thrust, and cut off 1 minute early. Instead of the planned 858 x 35853 km orbit, an orbit of only 592 x 17528 km was reached. The 3.1 ton (with fuel), 2.5 kW spacecraft carried two pairs of ion engines, and had adequate xenon propellant for those engines to reach geosynchronous altitude, the first ever rescue of a satellite mission using electric propulsion. The satellite reached its operational orbit in 31 January 2003 using the four German RITA electric xenon thrusters. Artemis could then function as originally planned, as there remained sufficient chemical propellant for 10 years' operation. Artemis was to provide voice and data communications between mobile phones in Europe and North America, and act as a relay satellite between low-Earth orbiters and ground stations. As part of the planned EGNOS system (to be operational by about 2010), it was eventually to provide navigation/location determination as an independent European counterpart to the GPS and GLONASS fleets. Japan's BSAT-2b communications satellite was stranded in a useless orbit when the Ariane 5 rocket carrying it to space suffered an upper-stage engine failure. Japan's BSAT-2b was planned as a geosynchronous television broadcast satellite for the Japanese B-SAT company. It used Orbital's Star 1 bus and had a launch mass of 1298 kg. It carried a Thiokol Star 30 solid apogee motor and a set of station-keeping thrusters with 200 kg of propellant. The Ariane 510 vehicle carrying it to space failed to reach its correct orbit. The solid boosters and main stage worked as planned, and put the EPS upper stage in the planned near-suborbital trajectory. The EPS stage then fired, but the Aestus engine failed to reach full thrust, and cut off 1 minute early. Instead of the planned 858 x 35853 km orbit, only a 592 x 17528 km orbit was reached. Since BSAT 2B carried only a soild propellant apogee kick motor, it was unable to maneuver itself to a useful orbit. Russia launched the R-29 IRDT-2 re-entry vehicle test flight from a submarine in the Barents Sea, but the flight vehicle has not been found. IRDT (Inflatable Re-Entry and Descent Technology) is a new technology designed to return payloads from orbit without a heavy heatshield and parachute system. An inflatable cone provides protection during reentry, and a second inflatable extension of the cone reduces the speed further for a safe landing. The IRDT concept was initially developed for the surface probes of the Mars 96 mission which were lost in November 1996 due to launch failures. The Russian Navy launched the IRDT-2 test spacecraft on 12 July 2002 using a surplus R-29R Volna from the submarine K-44 Ryazan. The spacecraft was launched on a suborbital trajectory from the Barents Sea and landed in Kamchatka. After third stage separation, the IRDT fired a boost motor to increase its speed, and then inflated the first stage of its heat shield. Reentry velocity was 7.0 to 7.3 km/s. The IRDT 2 flight vehicle has not been found. It is believed the payload's protective cone detached too early, and the IRDT 2 payload was damaged during the Volna launch vehicle stage 3 burn. Bigelow Aerospace successfully launched their Genesis 1 inflatable space station test article on a Dnepr rocket from southern Russia. In NASA's view: Genesis 1 is an American entrepreneur's inflatable satellite that was launched by a Dnepr rocket (a converted ICBM, known as SS-18 Satan) on 12 July 2006 from the southern Ural mountains. The 1,300 kg craft was successfully inflated about two hours after launch to its normal cylindrical size of 2.4 m x 4.5 m. It is made of a tough sheet fabricated from a composite Kevlar that is often used in bullet-proof vests. Bigelow Aerospace' goal is to launch a few more of them, string them together and promote "space tourism." From the perspective of the private space exploration and development community, Genesis 1 represents an important milestone on many fronts. Not only was Bigelow Aerospace able to get their satellite successfully launched into orbit and functioning correctly on technological grounds, but they were also able to surpass the political and regulatory hurdles necessary to achieve the goal. Many "private space" enthusiasts share Burt Rutan's take on the project - "Go, Bob, go!" - a comment he made when asked for his opinion by a reporter. Unlike the simplistic view put forth by NASA of the project, Genesis 1 represents the first step in Bigelow Aerospace' plans to develop space facilities that are cost-effective alternatives for a wide variety of markets. Space tourism will undoubtably be a component of the user spectrum the facilities support. However, their plans will open doors to many other efforts that are now infeasible: Making space-based facilities available on a leased basis, rather than solely by purchase, will drive operational costs down, since the overhead of getting the facilities into orbit will be spread over a range of users. Thus, Bigelow Aerospace is making significant business advances with their effort, in addition to the technological and political/regulatory ones. The philosophy driving Bigelow Aerospace and their planned offerings are described in the Mission Statement and Pricing for Orbital Activities sections of the company's Web site. For more information about the history of inflatable spacecraft Bigelow Aerospace is building on, follow the links in the Bigelow Spacecraft menu in the footer of their Web pages.